One way to win more points, and generally raise your level, is to get really good at 3rd ball attacks. This is where serve, your opponent returns and you attack the next ball. Sometimes this may be a winner, but not necessarily. Basically, it’s your opportunity put your opponent under pressure and take control of the rally. Want more videos like this? Please subscribe to my YouTube channel. 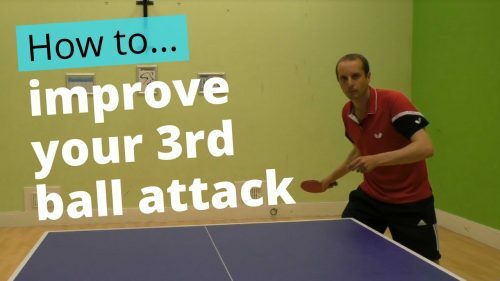 I just finished watching your recent post on improving 3rd ball attack. Super info, and I especially liked the emphasis on Always Expect Your Serve to be Returned, and where/how it likely may be returned. Very clear presentation. Could you please “amplify” the return of a serve with heavy sidespin. For example, if I serve with heavy clockwise rotation to receiver’s FH, where will it likely be returned AND importantly what spin will I likely see coming back? Ditto for heavy CCW spin to receiver’s BH. Any general rule?? So in general, if you serve CW spin to receiver’s FH, the ball will want to kick towards your backhand. But, because you are serving to FH, the receiver may compensate and aim more towards your FH. So if it is a passive return, the ball will likely land somewhere between BH corner and middle of table. If your opponent likes to topspin or flick, it may also be returned to FH corner. For CCW spin to receiver’s BH, the ball will want to kick towards your forehand. Again, this is ‘in general’. A lot depends on your opponent and how he/she likes to return serves.